1⁄2 kg. 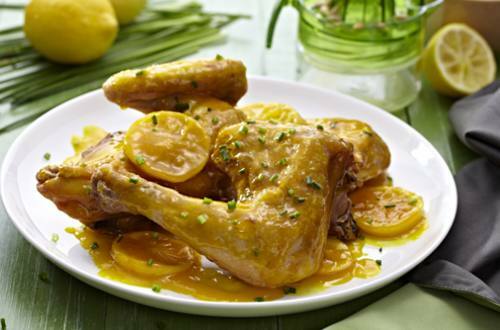 chicken leg and thigh, cut into serving pcs. 1 To prepare a more flavourful dish, you must first break the Knorr Chicken cubes until you achieve a sand-like texture using either your hands or a fork. Then, rub this evenly unto the chicken pieces. 2 For the next step, you’ve got to pour in the lemon juice, garlic, lemon zest, chives, sesame oil, honey and pepper. Let this stand to marinate for an hour and then drain. Reserve the marinade. 3 Transfer the chicken into a greased baking pan with a drizzle of canola or olive oil on top. Sprinkle the lemon rind before baking in a 425 F oven. Cook this until the juices from the chicken come out clear. 4 Transfer to a platter with some chopped chives on top. Now, the wait is over because the chicken wings are done! Truly refreshing and addicting!